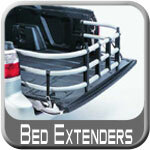 At Brandsport.com we offer you Truck Bed Extenders that add almost 2 feet to the length of your bed! Made from durable and sturdy material, they ensure that your load will not be sliding out of the back of your truck. These bed extenders are easy to install and are a great purchase when it comes to securing whatever it is that you�re hauling. The majority of these extenders have the capability to fold back into your bed and protect your load that isn�t quite as large too. These are a common purchase and have gotten rave reviews as a reliable and durable product. It seems that no matter how long your bed of your truck is, sometimes it just is never enough and you need just a little bit more room. These extenders offer you that luxury and that convenience. Look through our selection and find the extender that you think will compliment your truck and give you that extra length and protection you want.